Most of the Indian women love home decor. I too enjoy decorating my home particularly during festive occasions. Virtual home tours inspire home decor lovers and these help in giving them creative ideas too. 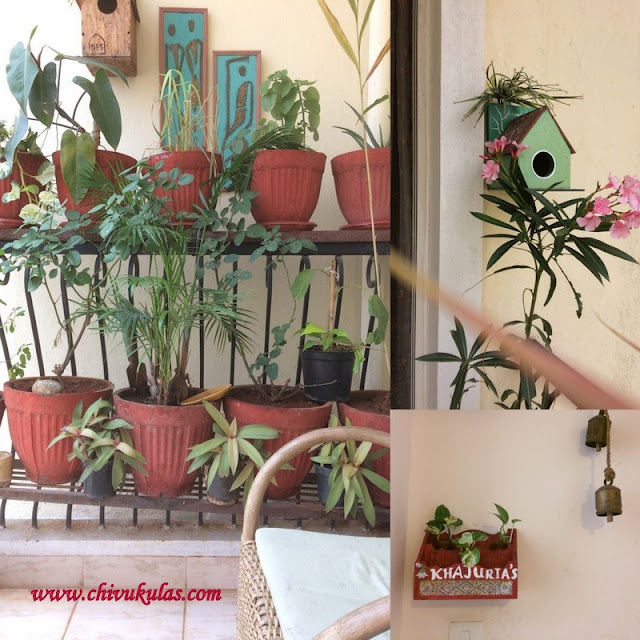 In this blog post, I'm going to share a virtual home tour and beautiful pics of a cozy home of Mini Khajuria that is well organized and beautifully decorated in a flat in an apartment in Bengaluru. Mini Khajuria - a home-maker based at Bengaluru - says that Indian women are generally confined to homes and are not much into the fields of commerce and economy. Presently there is a change in the outlook of Indian women who are keen on becoming financially independent. Many Indian women, particularly home-makers, are keen on becoming entrepreneurs, Mini Khajuria had to give up her career to look after her family and kids. 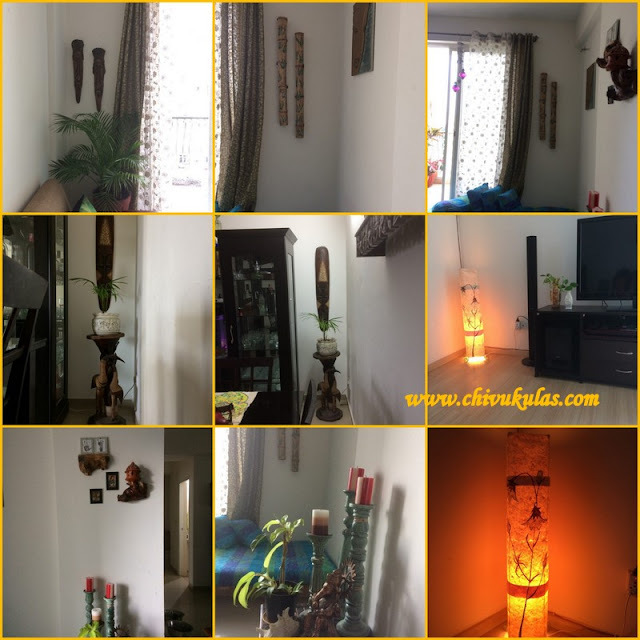 She was keen on utilizing her free time in a productive way and she thus started experimenting with different techniques of home decor. 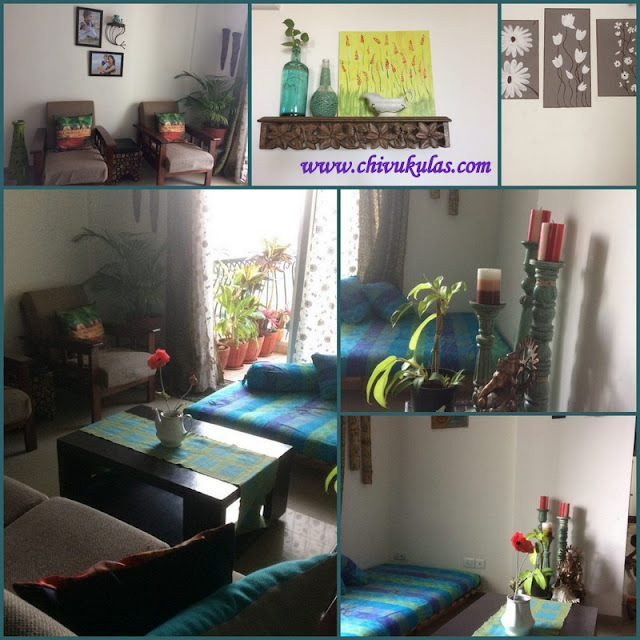 She was motivated by her near and dear ones to set up an e-commerce on home decor. Though she is a full time home-maker, she is making decent earnings. Here is a virtual home tour of Mini Khajuria who stays in a flat in an apartment in Bengaluru. 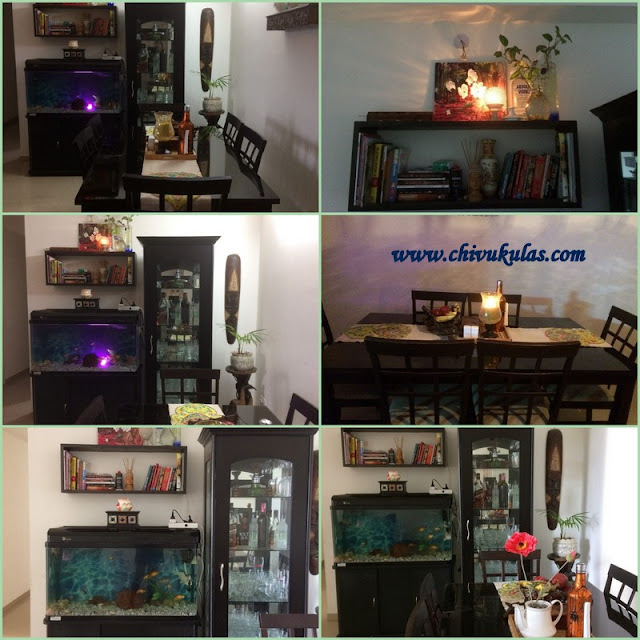 She has perfectly utilized her dining space with crockery unit, a small shelf on top of fish aquarium. In the above pics the perfectly placed lighted candles / diyas reflects her aesthetic sense and her passion for home decor. 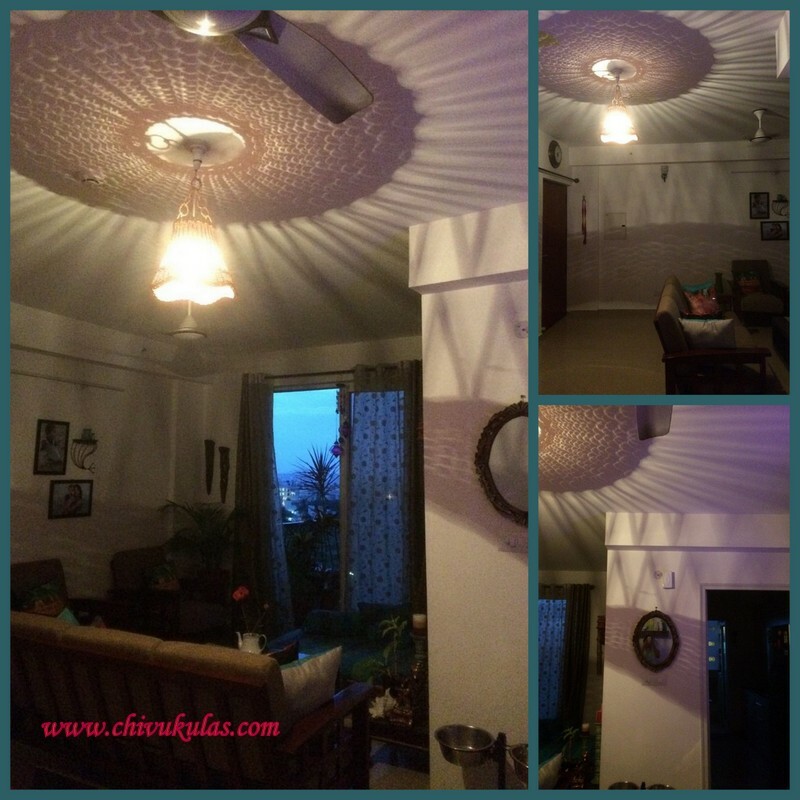 She is not only particular about the lighting but she is also keen on enhancing the beauty of every nook and corner of her home. There is an ethnic look in the corners of her living space and the greenery / indoor plants enhanced the beauty of the corners. Besides beautifying the corners of her flat, Mini has beautifully decorated the walls with blend of modern and ethnic touch. And the highlight of her living room is the radiant ceiling which doubles the beauty of her home. Her flat is in one of the top floors and you can see the beautiful view from the balcony. And of course, she is keen on adding greenery / potted plants to her balcony. Let's go on a virtual tour to have a look at her green balcony with a cute little bird house. In the above pic you can see the name plate at the entrance door. How creatively she placed those money plants on the name plate! And the ethnically looking metal hanging bells. It's a real feast to the eyes. Mini's well organized and beautifully decorated flat reflects her passion for home decor. Images provided by Mini Khajuria.